Something light and something cold. That’s been the main reply from each of us this summer when the other has asked, “What shall we eat today?” If you read our Fethiye news updates, you’ll know that we’ve made so many of our staple salads over summer – our salad of green lentils, a tangy chickpea salad, filling but refreshing barbunya pilaki. And we’ve also been using seasonal spring and summer fruits to play about with our new love; a frozen yoghurt recipe. Some days get so hot that it’s almost taxing to even think about what to eat. Having all these healthy goodies in the fridge means we can just reach in there and spoon as much or as little as we like onto a plate and graze. We often have yoghurt with fruit and honey for breakfast and this frozen yoghurt recipe is just a different take on that. Same ingredients, different texture – and freezing cold! Just what we’re looking for in the summer heat. You know us. Where possible, we like to keep things local and we like to keep things seasonal. This frozen yoghurt recipe is no different. All ingredients are local and we’ve used seasonal fruits. 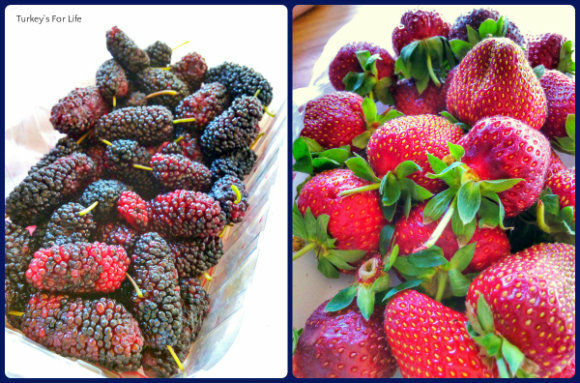 In Fethiye, mulberries (dut) and strawberries (çilek) are out in April/May and that’s when we bought our fruits. The mulberry frozen yoghurt, we made immediately. The strawberries; well, we’d made our simple strawberry sandwiches, we’d played about with puff pastry and made a little strawberry puff dessert and we’d eaten more besides. This batch of strawberries in the top photo; we knew we were going to make a strawberry frozen yoghurt recipe with them but we wanted to wait a while. So they were washed, stalks removed, roughly chopped and put in the freezer in a sealed container. If you want to do the same, your strawberries will last in the freezer for around 12 months. They’ll change colour and texture but, for dishes like frozen yoghurt, they taste just fine. When we were ready to make our ice cold fruity treat, we bought the thick, creamy, süzme yoghurt – local of course – and also the honey. Fethiye honey. Honey, because, well, if we’re being healthy and eating all those lovely Turkish meze and salads, there’s no point undoing all that by heaping spoonfuls of sugar into our mix. No. We’re looking at how to make frozen yoghurt without sugar. And we’re making our frozen yoghurt at home, with a blender. No ice cream maker. Aside from the fact that we don’t own an ice cream maker, it’s just too hot to be making life complicated. 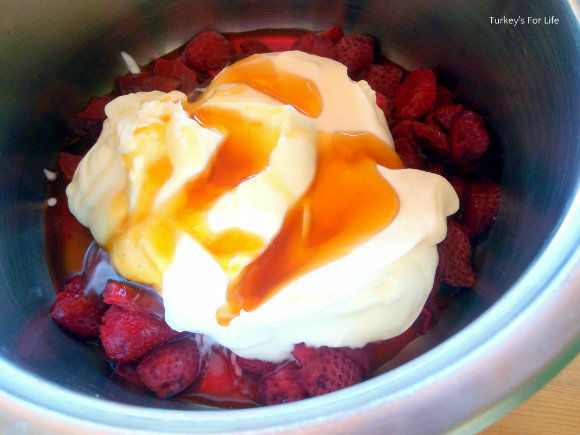 Three ingredients: chopped frozen strawberries, thick and creamy strained yoghurt and a generous drizzle of local honey. Oh, and when we say ‘blender,’ we use a hand blender. No large kitchen contraptions in our house – the house isn’t big enough! 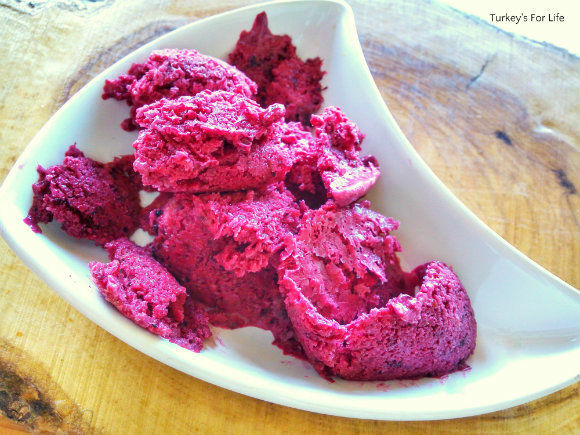 Once you’ve blended your strawberry frozen yoghurt recipe ingredients, pour the mizture into a bowl that you can put in the freezer with a seal on. Just look at it. You can eat your yoghurt now, if you like. 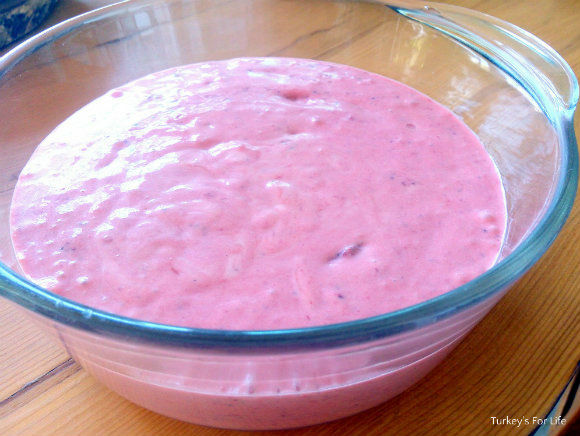 This is a creamy, cold, homemade strawberry yoghurt. We don’t blend until it’s completely smooth. A few little strawberry pieces are a little treat when you come to eat it. This summer frozen yoghurt recipe is healthy, light and refreshing. Most summer fruits will be suitable. Frozen yoghurt is ideal as a snack or as a dessert. Add your strawberries to a large bowl. Now add your yoghurt and honey. Now blend for a couple of minutes until smooth - leave a few pieces of fruit intact, if you prefer. Place in the freezer, stirring occasionally, until you're ready to serve. Please not that calories are meant as a guide. Calories for this frozen yoghurt recipe are based on our strawberry frozen yoghurt recipe. If you leave your yoghurt in the freezer for a long time without stirring, it will completely freeze. If you want a more 'soft scoop' frozen yoghurt, you will need to add sugar. Other seasonal summer fruits such as peaches or nectarines will also work well for frozen yoghurt. We use Turkish süzme (strained) yoghurt. If you can't get this, Greek yoghurt from supermarkets will do the same job. And that’s our simple, homemade frozen yoghurt. No added sugar and all local ingredients. Lovely! And now it’s time to serve the frozen yoghurt. Now, it is completely down to you when you serve your yoghurt. We left ours in the freezer overnight both times because, remember, we’re just looking to eat all things cold. Because the frozen yoghurt has no added sugar, it will freeze solid. If you’re looking for a soft-scoop ice cream feel, this is where you need to start adding cream and sugar – and that’s not what we want. For a sugar-free frozen yoghurt recipe, give your mixture a stir occasionally whilst it’s in the freezer and serve when you have the texture you want. And that’s it. Fruity, healthy, filling – and, best of all, cold! Use whatever soft summer fruits you like and experiment away. Although this is not a traditional Turkish recipe, we have added it to our list of recipes from Turkey. This is because we have used local ingredients. Before the the ingredients are blended to make frozen yoghurt, it is perfectly traditional to eat fresh fruit with yoghurt and honey at the Turkish breakfast table.